At the dawn of the 17th century, early newspapers began to replace oral news by manufacturing natural events to fit a single page. Bolter (2001) would refer to this shift in communication as the “remediation” or replacement of one medium for another more innovative technology. Prior to scheduled news distribution, people exercised more of their own judgement over what they heard, passing information on to others orally. In contrast, daily printed news became more about national viewpoints regarding politics, economy and culture that aim to centralize the British political system (Williams, p.7). McLuhan (1964) and Ong (2002) agree that writing has the power to restructure the human consciousness, meaning that British citizens were being conditioned to believe specific opinions that were approved by the government. American president, Thomas Jefferson (1787) also recognized the power of print in his quote: “were it left to me to decide whether we should have a government without newspapers, or newspapers without a government, I should not hesitate a moment to prefer the latter.” Even today, it is not uncommon to think of the news as being a realistic account of history but we should not be fooled, journalists are talented in the art of sculpting the reader’s perspective. Barber (n.d.) refers to written news is merely the occurrences that catch the attention of journalists on one particular day. Before written news was available, people exchanged knowledge orally. Messengers spread news about the victories and tragedy of war and Town Criers roamed village streets publicizing births, deaths, marriages and divorces (Stephens, 1998). Written news was first distributed in the form of a one-paged pamphlet. In the early years news pamphlets exposed facets of news that could be applied universally to later forms of print news. The first news pamphlets competed with ballads and found their niche in the printing enterprise by sensationalizing news to ensure people would purchase them. News writers sensationalized their writing style by using attractive headlines and promising intimate details to attract readership (Streckfuss, p.89). The first publishers – a word that was first used to describe news writers, editors, etc… – waited for suitable news to appear, confirming its importance by reproducing it in written form. A more passive approach to circulating news continued due to the expenses involved in printing news (Streckfuss, p.90). Bolter (2001) explains that “each culture and each period has had its own complex economy of writing,” and as newsprint gained economic importance, the formerly submissive newsgathering techniques would soon change. Despite financial restrictions, news writers aspired to speed up the production of newsprint. Publishers understood the need to print news before the competitor, often cherishing news regarding war because the topic of war increased news sales and acted as a way to accelerate news production. The transition from publisher and corrector to journalist and editor prompted a consideration for the reader. “The news in the pamphlets was meant to confirm existing values, to let readers share their hatred against common enemies, to pride themselves on British accomplishments and to have reinforced their world view” (Streckfuss, p. 93). For early pamphlets in England, news was written for a particular group of Anglican anti-Catholic merchants, artisans and members of trade. At this point, the press was not tied to the church or the state and was still relatively free from authoritative restrictions (Streckfuss, p. 94). Early newsbooks and ballads could not be considered newspaper as they were often only printed once. The first successful English newspaper surfaced in 1621. Publishers of the first weekly newspapers struggled to fill the pages with fresh and relevant news. The printing press brought about a more rigorous and consistent publication schedule; first adapting to the pace of a weekly schedule and later to a daily schedule. This shift highlights the economic pressure imposed by the rapid pace of the printing press. 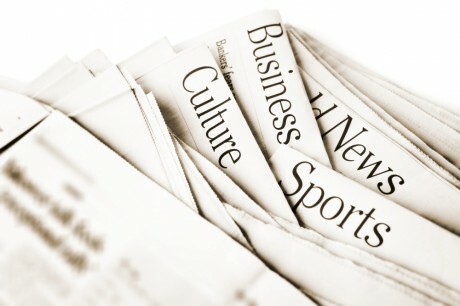 The oldest existing newspaper, printed in England was first published on September 24, 1621 and titled “Corante, or weekely, newes from Italy, Germany, Hungary, Poland, Bohemia, France and the Low Countreys.” News articles found in early newspapers were not necessarily altered from their original form. An editor by the name of Thomas Gainsford made attempts to create a system that reworked original news items into reader friendly stories (Stephens, 1998). Prior to the Civil War in England from 1642–1651, most countries were carefully monitoring print news. In Europe, publishers were only permitted to print if they did not discuss local or national politics. 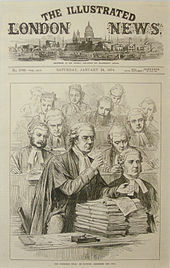 Following the Civil War, national news gained new importance and under the unstable leadership from the parliament of England, the first English newspaper made attempts to challenge royal authority by reporting uncensored national news. When Oliver Cromwell established his authority in 1653, he stiffened newspaper regulations by permitting only a small number of newspapers to be printed. The freedom of the English press emerged once again after the failure of the Licensing Act of 1695 (Stephens, 1998). At this point, English citizens were starting to value the right to public opinion, freedom of speech and ultimately, freedom of the press. Towards the beginning of the 18th century, regular published newspapers started to have an important role in commerce by advertising and chronicling market reports. The first profitable daily newspaper in England was the Daily Courant in 1702. During the Eighteenth century, England saw newspapers become filled with social and political commentary that was accessible to working class citizens. Newspapers in the American colonies emerged much later due to a smaller populace and more stringent government regulations. As in England, penny newspapers also existed in America. The major difference between American and English penny papers was that because England “lived outside the law,” English papers were more extreme in their political commentaries (Stephens, 1998). The Publick Occurrences, which is considered the first American newspaper was issued without authority and abruptly suppressed due to its political content. In 1704, the Boston NewsLetter became the first profitable newspaper, guided by John Campbell (Sloan, 2005). 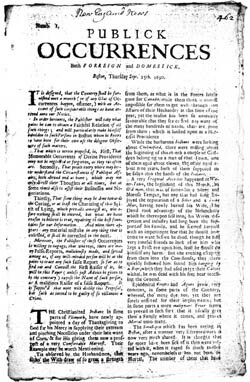 Around the time of the Revolutionary War in 1775–1783, dozens of newspapers were distributed among all of the colonies. Information that emerged from these newspaper articles greatly influenced American political opinion to fight for political independence from England (Barber, n.d.). As an independent nation, America newspaper circulation continued to boom and was used to circulate national affairs to all of the colonies. The Bill of Rights in 1791 secured the freedom of press and by the 1814, 346 American newspapers existed. The advancements in printing technology allowed for the materialization of the “Penny Press” which sold for less than a cent (Barber, n.d.). The accessibility of low-cost reading materials significantly impacted literacy and thus democracy in America. Since its emergence in the 17th century, the newspaper has taken over 400 years to develop its written form (Williams, p.4). Written language strengthened the reliability of news and improved literacy through the public’s desire to be informed. Although not consider a newspaper, the first written news in Europe was said to begin the process of formalizing language (Stephens, 1998). The history of the newspapers was primarily established in Great Britain, as the British were keen to be involved in sharing national politics and social matters. The geographical size and concentration of population in England also played a part in ensuring the success of the British press. As a relatively small country, with the majority of the population living in or adjacent to the nation’s capital, newsprint could be easily distributed to the masses (William, p.6). In contrast to written history, newspapers became a public platform for questioning, rejecting and resolving public matters. The elite were no longer the only people with access to information. The British press voiced public opinion; functioning as a way to access current news and bring people together through shared political and moral perspectives. Bolter, J. D. (2001). Writing space: computers, hypertext, and the remediation of print (2nd ed.). Mahwah, N.J.: Lawrence Erlbaum Associates. McLuhan, M. (1964). Understanding media; the extensions of man, ([1st ed.). New York: McGraw-Hill. Ong, W. J. (2002). Orality and Literacy. Cornwall: Routledge. Sloan, D. (2005). John Campbell and the Boston News-Letter. Early America Review , VI (1). Streckfuss, Richard. (1998). News Before Newspapers. J&MC Quarterly, V75 (1). Williams, K. (2010). Read all about it! : a history of the British newspaper. London: Routledge. This entry was posted in Research Paper and tagged freedom of press, remediation. Bookmark the permalink. I really enjoyed the information about newspapers! It’s interesting to consider the impact that an inexpensive medium can have upon politics, literacy, and the world overall. I loved the English civil war cartoon you used with the collector chasing the King chasing the taxpayer and would really like to use it in my Social Studies classes – where did you find it? What a great breakdown of the different forms of written “news” that were being offered to readers at various times in history. It was interesting too to read the difference between pamphelts and newsbooks and who the intended audience was and how that impacted the means of conveying the message. Really great. Thanks. You did a great job of laying out the origins and ups and downs of newspaper culture. I can understand how a single source of news would be a powerful tool for unifying a countries’ general opinions. You can put the words and images right in readers’ heads without them discussing/learning it with others. What an innovation! I wonder how terrified past leaders who wished to abolish free press would be with the current state of blogs, tweets, and online newspapers available to the masses? Or is the free press just as manipulated now as it ever was? Has technology really made a change?